All the holiday parties are over, all the cookies and chocolates are gone, but unfortunately what stayed with me, and perhaps with you, are a few extra pounds (according to that darn bathroom scale), and a few inches in the waist line. Oh well, at least we all had fun, and got carried away a bit, but it is all fixable with some determination and will power. Here comes the dirty word…Diet…, and I am about to introduce you to a very relaxed way of getting back into shape, by learning to eat healthier and to keep your body moving. Personally I don’t even like to think about being on a “diet”, since I am not one to count points, weigh my food, live on pre-measured and pre-packaged meals, or stick to high fat foods without any carbs, or indulge on some sort of a cabbage soup, etc. I have heard about all of these from my family and friends, who experienced all of the above, and yes, some were quite successful, but it’s just not for me. I also am not a “gym rat”, but I do enjoy swimming and walking (mostly walking, since it is the easiest thing to do anywhere ,even at the mall while shopping…). Does lifting and carrying around my 25 lbs. granddaughter count as “weight lifting”? ?..if so then I do that on a very regular basis, with love I must add. 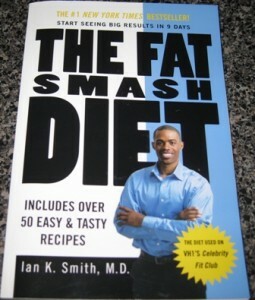 A couple of years ago, a co-worker told me about the Fat Smash Diet book, written by Dr. Ian K. Smith. I looked through her copy, and liked what I learned, so I bought my own copy (it was only $12.95, unless you select the newer version which offers a larger selection of recipes), and decided to give it a try. I am beginning my Phase One, on Monday, February 1st (after a weekend, of course), and if you would like to get this book and familiarize yourself with it, and join me (misery loves company…it’s not really misery… it’s actually fun, but more fun with a fan club), that would be great. Either way, I will post the list of suggested and excluded foods for each phase, so you can be creative with incorporating these into your menu planning. Believe me, there are lots of choices, many more that I normally would need to stay satisfied. It is suggested to have 4-5 meals per day, in moderate portions of course, and at least two snacks. So wouldn’t you agree that there is no way to be overly hungry, and better yet, you eat the foods you are use to. However, as with any changes you plan to make to your system, you might want to consult with your physician, and do not give up those daily vitamins. much more pleasant than it sounds. I love the fruit and yogurt smoothies! diet, but now you are learning how to make healthier choices. and introduce some additional ones. is to apply your knowledge , enjoy your food in moderation, and keep your body moving. Throughout all the phases, you are required to stay physically active, and the book lists several exercise suggestions for you, but all I was doing daily, was walking briskly 10 minutes during my lunch time, plus at least 45 minutes after work, plus making 3-4 rounds of stair climbing at home in the evening…no biggie, and quite doable. If you already have your own daily exercise routine, that might work for you as well. During the 90 day period, my body felt so much better, I lost 15 pounds, and brown rice and I became best friends for life. I have slacked off during the past year, so of course, I gained back few of those pounds, but am still ahead, so it’s time again to practice what I preach. If your goal is greater than mine, have no fear, you can easily achieve it by increasing your daily exercise routine, and sticking to your routine and schedule. I would love to know how many of you plan to join me on this mission. The more the merrier!! In my next post I will provide you with the food list for Phase One, in case you did not get a chance to buy the book, or you are not ready to join me at this time. Tip: On my first day of this program, I weigh myself very early in the morning, just before jumping in the shower. It gives me a good start, and it’s a motivating factor for me. After that, I try to check my weight every Monday morning. Ohh this sounds like a diet that might actually work. And since it worked for you, it might just work for me, too. I am fairly certain I need to detox anyway. Thank you Meream. You are such a good sport! I am really looking forward to this Monday….my first day, second time around, of detoxing and healthy eating. detoxification programs can be done at home. It is a body detoxification program at home that can be easily monitored, and for two weeks or more. These programs are designed to help you lose weight, improve circulation, increase body elimination, colon cleansing, detox diet, and provide nutrients to the liver. If you still do not know yet, the liver is the principal organ of the body, which is responsible for the detoxification process. So you really need to protect and support this body. Thank you very much for your expert opinion. I totally agree with your feedback. Hopefully many of my readers will read this and my other posts about one of the detox methods which I used, and will consider cleansing their bodies to make them healthier. Fruit and vegetables are foods you can eat in unlimited quantities. These are ideal for snacks, if you feel the demand for something sweet. The focus of your meals provide fruit and vegetables. Even if you can get fruits and vegetables in season, the frozen vegetables give you that you need the food. That is why this is my favorite diet. I LOVE fruits and vegetables. Although some fruits (bananas), are high in sugar, so you still need to watch the quantity. I am on a detox diet right now. It’s a little bit more intense but it’s a short one. I’m looking forward to feeling good and get back my energy again. I’ve been feeling super sluggish lately but I know it’s because I haven’t been eating super clean for awhile now. Once your cleanse your system, and start eating healthy, and exercise, you will get your energy back, I am sure. it’s nice post, i’ve really enjoy to read your post. Is this healthy for a 12 year old?